Sueno Hotels Golf Belek is rated 4.5 out of 5 based on 13 verified reviews from YGT customers. 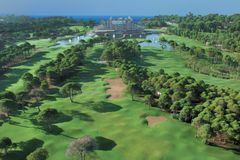 The Sueno Golf Hotel is one of the newest additions to the Belek golf holiday landscape but is already among the best. Located at the heart of two championship golf courses and just a short distance from the beach, the Sueno has everything a golfer could wish for. The two courses, the Pines and Dunes, are varied in character and difficulty, ideal for golfers of all abilities. Situated on the coastal paradise of Belek in southern Turkey, Sueno Hotels Golf Belek is just a few minutes from the town centre and only 30-minutes from Antalya Airport, not that you will want to leave the all-inclusive resort. Offering a truly 5-star experience, guests are able to use the fantastic facilities at Sueno Hotels Deluxe Belek as well as the great on-site options. Sueno’s second course is the Dunes, which is suitable for golfers of all standards. It does, however, still tip the scales in excess of 6,500 yards, and is no pushover. Enormous bunkers and the links-style shaping are characteristics, but it is the Dunes’ closing hole which is the lasting memory – pluck up the courage to find the putting surface at the 18th hole’s amazing island green. The Sueno Hotel is wedged right in the middle of the fantastic Pines and Dunes golf courses! Once you've finished your round it is well recommended to sit and enjoy a apres golf drink overlooking four of the greens of the Dunes and Pines courses, if you get the chance we'd recommend teeing off in the first 4-ball of your group of golfers so you can enjoy their attempts at clearing the water on the island greens! Sueno's signature hole certainly requires some solid golf in order to achieve par. With little margin for error, golfers must carry 214 yards over water, to a green containing a pin dangerously near a green side bunker. A safe option would be to aim away from the pin, but with this tactic, a two putt might not be so easy! From deluxe bathrooms to air-conditioning, the 147 guestrooms at the Sueno Golf Hotel are superbly equipped, also including direct dial telephone, plasma screen satellite television, wireless internet access, safe, mini-bar, hair dryer and private balcony. The 5* Sueno Hotel captures the essence of Belek, where golfers are not only treated to a fine array of championship golf but are also based in the lap of luxury. No stone is left unturned at the deluxe Sueno Golf Hotel, which is among the finest of Belek’s superb golf holiday options. Hamman therapy and massages are among the specialities in the spa centre, while the hotel also offers a well-equipped fitness suite, swimming pools, tennis courts, football pitches and a mini-club. The Chef’s Restaurant and the Albatros Dining Room are among the fantastic culinary options at the Sueno Hotel. The Sueno Resort is what some would say “a little tired”. That is understandable as down at the beach Sueno are building a 1200 person new luxury hotel which looks amazing! Having said that, the hotel was still very clean, tidy and presented well. The rooms where very spacious (we were upgraded to a Senior room at no extra cost!) and if you get the option request (before you go!) a golf course view. They do offer an “A La Carte” option each evening which varies the theme each evening – book as soon as you get there as some of the evenings get sold out quickly. The transfer time of about 30 minutes was really convenient and we had no hassle on the 14-seater transfer bus. The hotel itself is a 4-5 minute walk from the beach but they run a shuttle service if you are that way inclined – the walk is fine and nice to stretch your legs after a game of golf. One thing the Sueno does have that we all *REALLY* enjoyed was the beach pier. It’s larger than every other hotel’s, very spacious and the staff are very helpful. They don’t supply lunch/food on the pier but that is available in the beach bar/café – maybe a thought for them to consider. The location of the hotel in relation to the golf courses is perfect and sitting watching golfers come down the 9th/18th is very enjoyable. Overall verdict – this was our first all-inclusive golf holiday and we all rated it 9/10 – the food being the only *slight* downside. We will definitely return to Turkey and even to the current Sueno as the Pines course is very good and we would like to play the Dunes as well. I rate both of the golf courses at Sueno very highly and really enjoyed playing them. We played Pine 7 times and Dunes 6 times in the 7 days we spent in Turkey and both courses were in fine condition. One or two of the tees were a bit worn but it was late May. The location is great as the hotel is right on the course. The accommodation was good; clean and had everything you could want. The décor was getting a bit dated but that was a minor point. The food was great with plenty of choice of fresh & tasty dishes. We didn’t use the 19th hole as we were usually rushing for lunch or had a drink in the hotel but it was well used by visiting golfers who seemed to be enjoying it. The members of staff were friendly and helpful. We are actually in the process of booking for this year again. I’d give it 4.5 out of 5. As far as the golf courses are concerned, they were both in very good condition and were enjoyed by the group. Having the courses so close at hand, together with the practice facilities is great. Whilst we would be happy to play the courses again, particularly the Pines, I would not stay at the hotel. I would rate the hotel as 2/3 and the courses at 4. I understand that there is a new hotel being built. It would be interesting to know what they charge. I have stayed at the Sueno Golf Hotel on two occasions with a party of 24 and I would say that they were two of the best golf holidays I have ever have had the pleasure of being a part of. The all round experience was excellent. From the rooms we stayed in, to the staff, both golf courses (which I would rate among the best I have ever played) and the food, I would give this package deal a rating of 5 anytime. Anyone who takes the opportunity of trying this holiday will not be disappointed. The 2 golf courses at Sueno were testing and in good condition. With the courses and hotel all on resort, it’s very convenient too due to not having to travel. The hotel and staff provided a good and friendly service at all times. The room was good but air conditioning unit failed to work; thankfully it did not spoil our holiday. The overall verdict would be 4 out of 5 and we would definitely return to this venue. The beach area is nice, but the restaurant down there isn't the best, so I would lunch at the main one, unless the grill is open. The pier is a great place to relax and get a drink, while there are loads of loungers available. The food was good, if not great, and there’s a wide selection for the picky. The outside grill was always much better, and the breakfast outside (show Grill) was better than the main buffet. From 4-7pm no food was available, which is a bit annoying if you have an 11am tee time, as when you finish nothing will be open...something they should look at perhaps? Rooms are big and are fine. The air con only works with a key in the slot, but this is pretty normal. Overall the whole group had a great time and enjoyed all the facilities available and would definitely go back. Compared to my previous visit to the Cornelia deluxe, the hotel was not as good in terms of food quality, level of drinks (premium) and general service, but the unlimited golf and price made this a very attractive trip. The weather was 30-33 degrees everyday in mid September so very nice all in all. Just returned from our third visit to Sueno; this time with friends. We were as impressed as ever and our friends had a superb holiday too. The golf course was in excellent condition and the hotel was as good as ever. There was an excellent selection of food and even the fussiest of people would find it hard not to find something they liked. The rooms were excellent, overlooking the golf course providing magnificent views with the distant mountains providing the perfect backdrop. It was really nice that staff remembered us from previous years and showed they were very pleased to see us and sad when we left. As we went all inclusive the price of the drinks was irrelevant but a very good selection was available and the waiting staff were polite and friendly. I have recommended both yourgolftravel.com and the Sueno Resort to several people at our golf club and will continue to do so. Really enjoyed our holiday here, it was great to be able to stroll straight out of the hotel and onto the golf courses. We preferred the Pines Course but the Dunes was also enjoyable as it was a bit shorter and easier for us. The clubhouse is a great place to watch players come in with views over all 4 greens (9th / 18th of both Dunes and the Pines). We felt the unlimited golf packages were good value and look forward to returning here next year. What a great time we had, ground transportation arrangements were are excellent, great private transfers both ways with high quality transport. All the staff at the Sueno were very helpful and polite and the golf staff were fantastic in allocating or amending tee times. Both courses were in super condition and I look forward to deciding on our next trip. We certainly did enjoy our holiday, we played 14 games of golf in 14 days, 7 times on Dunes, 6 times on Pines and once on Montgomerie Maxx Royal. The Sueno courses were great fun and a good challenge. They were in very good condition, well maintained, greens were good, holding the ball well and very tricky with some crazy pin positions. We had no problem booking extra rounds above the 4 pre – booked. Second rounds were only bookable when we came off the first but again this worked out fine. I don’t know if this may be different at other parts of the season but for us it worked perfectly. The hotel was fine but I would say suffering a bit from age, I just think maybe it might benefit from a face lift. Not really an issue for us as we were there to golf and rooms had everything we needed, were spacious and clean. Food was fine for me with great selection of fresh salads and usually grilled meat or chicken. Breakfast was great with everything you could want (Turkish Delight for breakfast was a step too far for me though) Drinks were great with good cold beer, perfectly drinkable wine and really anything else you could want (and available 24 hours!) All staff that I met were courteous and friendly. The location was superb with our rooms overlooking the Dunes 18th island green. They said we had been given an upgrade. We were about a minute from the pro shop and another couple from the two first tees. It could not have been better. Yes, we would go back and yes we would use Your Golf Travel again. We really had no complaints. We really enjoyed our golf holiday to Sueno, the hotel might not be as grand as some of the newer monoliths in the vicinity but for golfers it is superb. The practice facilities on your doorstep are excellent. The food and drinks are very good with alternative dining options for a small cost. The staff were very friendly, you can walk out of the hotel straight onto the golf course, no courtesy buses or shuttles required here. Both courses are in great condition and visually superb. If the Pines could be lengthened it could be considered as a Pro competition venue. We had a mix of handicaps from low single figures to high ladies all of whom enjoyed both courses. The beach is a 10 minute stroll (or free buggy ride) past the driving range and has a bar and food available. The pool area is a little on the small side but most golfers went straight to the outdoor bars and with beer in hand watched players finishing onto the island and peninsular greens that conclude the two courses. We had a great golf break at Sueno Golf Resort. The hotel was lovely with a view over golf courses. We played 9 games of golf on 2 lovely courses and will certainly be going back. We recommend the hotel to all holders. Many thanks to Your Golf Travel for their help everything, it went without a hitch.